I love to embroider. It is a good thing to do while I am watching NCIS, as I can keep my mind on the show and get something done while I am watching TV. This embroidery project I found on Tipnut.com. It was free. I downloaded it last spring and copied it onto my material using my favorite marker - the Frixion pen. I just have to remember never to put my pen in the freezer. I just had to say that because there has been a lot of discussion on the web that those pen markings will come back if you put them in freezing weather. Living in California, I doubt my quilts will ever see freezing conditions. If they do, I will just iron them off again. In the mean time, I have a great marking pen that totally disappears when I iron the project. Here are the six blocks. I have completed five of them and am well on my way to finishing the sixth. The fabric you see behind the finished blocks is the fabric that will sash the blocks. I want to find a very large flower print that has that same green in it and will go with the blocks. I am not having much luck. The large prints are usually more modern. I need something that will bring out the more retro look of the blocks. Remember when you are going to embroider or applique on a block, to cut the blocks larger than what you want your finished block to be. The reason behind this is the fabric gathers up a little as you put your design on the fabric. If you start with the size needed for your quilt, your block will be too small when you are done embroidering. For these blocks, I started with a 12 1/2" x 15" cut. I have several other projects I have already done the embroidery on but not put them into a quilt top yet. I will share those as I go through them and get them done. I also have probably 16 or 20 other embroidery projects that I want to start. It is a good thing I am young enough and healthy enough to probably get a few of those completed in my life time. I just have to quit looking at more projects that come along. I am loving how they turned out. But then I love anything that has embroidery on it. 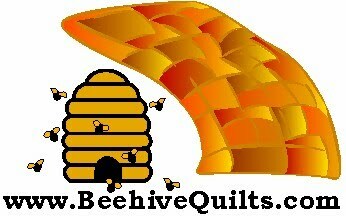 BeehiveQuilts.com fabric and pattern store is now closed, I am sorry to say. I have had it up and running since August of 2007 - 5 years. It has done well and I have enjoyed working on it. As my husband and I are going to do some traveling starting in 2013, I figured now was a good time to start selling off the product and getting some of my own projects done. Between on-line sales, e-Bay and having a studio sale in June, I have done a good job of selling a big portion of my product. I still have some that I will continue to sell items through e-Bay. You can find those items under probles22 on e-Bay. I have really loved doing this website. It was something I never thought I could do on my own. In the spring of 2007, Gil and I went to a seminar through Stores-on-Line and liked what we saw. They are a web hosting company out of Utah. We bought a license to try it out. I took this on by myself. With the help of the templates Stores-on-Line had and their tutorials, I designed it and stocked it and advertised it. It was wonderful while I had our bricks and mortar store open. It has given me an outlet and release after that closed down. I loved doing our Wildflower Rhapsody BOM and getting to know many of you who participated. [By the way, I still have some of the fabric for that. Let me know if you run short on any of it.] More than anything the site has done well enough to keep me in fabric money, which has been fine with me. I will keep working on this blog. I have used it to post ideas for quilting and pictures of quilts out and about and to help promote my website. It will still be used to put up ideas I find that I think should be shared. Elisa and I will continue to go to quilt shows, so pictures will keep going up that way. It will become a lot more personal as I work on my projects and goals. Plus when I travel, I will post where I have been and where I am going. One of my goals as we travel is to see as many quilt stores as I can before Gil tells me enough already. He is so good about that, I think I will be good for a few months. I will write of them and take pictures to share with all of you. I will also be asking you to tell me where to go, where your favorite sites are. Or to let me know of a quilt show that is coming to an area that we might be near at the time. Keep returning here. I want you to see what we see as we travel along. It will be fun for us all. Do you do quilting projects during summer? This seems to be an exceptionally hot summer. I am finding I am not working on projects related to quilting as much as I have in the past. I have had two quilts that needed their binding stitched down on for a few weeks. That is something I usually love to do. I finally made myself do one of them this past week. It seemed more of a chore than the usual delightful feeling I have. I normally love to stitch the binding because it gives me a feeling of completion to finish up a quilt. I do not know why it is different now. Maybe it is the temperature that is hovering around 100 degrees. I am also working on scanning pictures to make a digital library of some older pictures from both my family and my husband's family. My mother's 90th birthday is in October. To honor her, I am trying to get a good representation of pictures to display there. I hope to have some of the better ones printed out into large photos. The others will be displayed using a projector. My husband's brother had a box of mostly unorganized photos that came to him after the folks passed away. I am scanning them and identifying as many of them as I can. I have to be finished with them by our reunion in September. Then those that cannot be identified will be shown there using the collective memory of the brothers and sisters there. Then copies of the digital library will be handed out to those that want a copy of that history. It is exciting to work on those projects, but I miss all that I had been getting done in quilting. I have finished a quilt top for one of those events. It is a surprise, so I cannot tell you more about it. I will post a picture of it at a later date. It is on its way to the long arm quilter (my daughter) to be finished off. I am working on another quilt that is made of charm packs. I love those five inch square blocks, as they have 44 squares of coordinating fabric. I am putting them together on point along with white fabric. I have 3 of 8 rows completed [see the picture to left]. The rows will have coordinating fabric sashing between them. I have challenged myself that I must do at least one half of a row a day now that I have each individual block sewn to two five inch white blocks. I am sewing those strips together. That is going quite quickly. I did two rows yesterday. Each row has 10 strips each. The frustrating feeling I have about this project is I purchased coordinating fabric and cannot find it. I have 5 more rows to complete and then I will be needing that. That top should go together really quickly after the piecing of the rows is completed, if I find the other fabric. 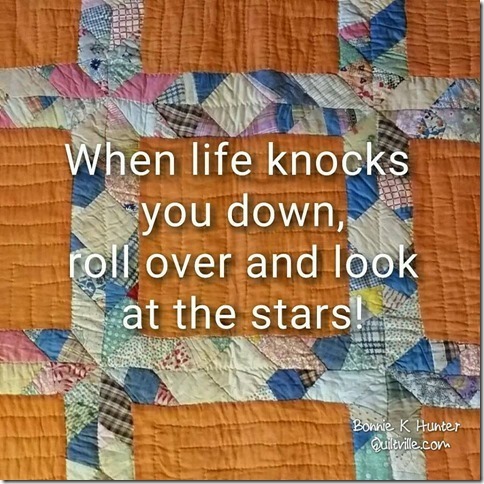 I would love to hear what projects you are working on - quilting or other. Share with us all in the comment section below.